In 2008, photographer Jim Harrison, whose portraits of Harvard community members have appeared in this magazine for decades, turned his eye to a new subject: the plants at the University’s Arnold Arboretum, where he began capturing the dramatic seasonal changes of a world-class collection of trees and shrubs. Photographers know that, when shooting outdoors, the “golden hours” just after sunrise and just before sunset provide dramatic light. For Harrison, that meant rising on some summer days at 4 a.m. to record the fuschia glow of first light, or venturing out into frigid winter dawns the day after a blizzard to record a landscape shrouded in shades of white. 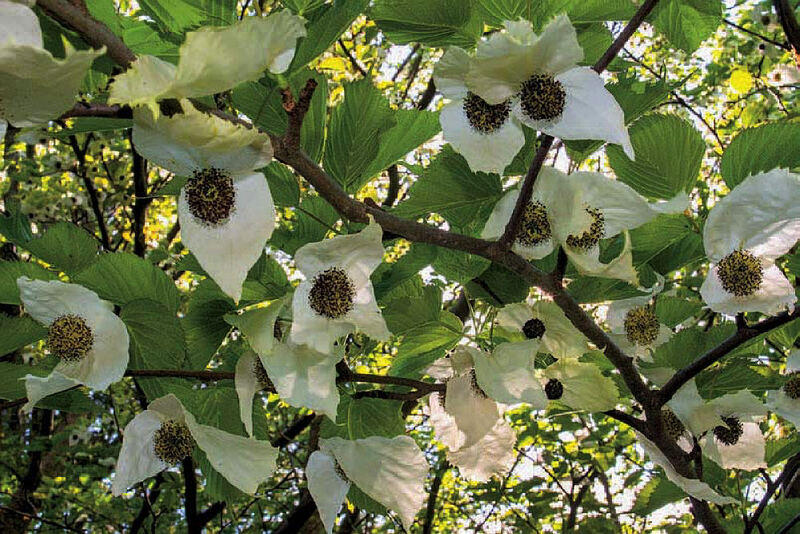 Some plants present specific challenges, such as the kerchief-like white bracts of Davidia involucrata, the dove tree, gently backlit by the sun in the image gallery. This summer, an exhibition of 31 prints from his project will open at the Arboretum’s Hunnewell Visitor Center. In Continuations: Seasons at the Arboretum (July 28 through the first week of October), Harrison’s fascination with the architecture of plants—the way they branch or form their flowers—is a thematic undercurrent. Another is decay: the bloom gone by, or the fallen leaf. A selection of photographs (see the image gallery above) from the exhibit illustrate those themes; they also show off some of the finest plant specimens growing on the Arboretum’s 281-acre grounds. 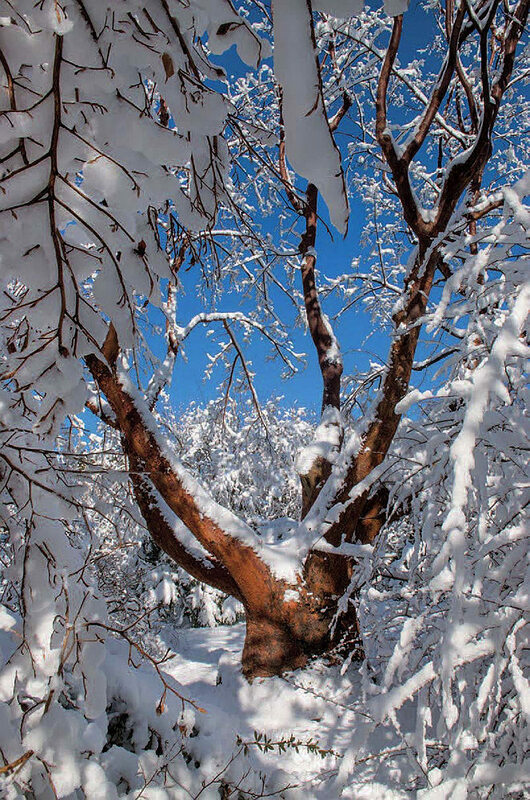 Above is Acer griseum, the paperbark maple, its cinnamon limbs capped with snow. The plant, known for its finely exfoliating bark, often grows straight up on a single, columnar stem, but this particular ancient specimen branches in surprising ways against the sky. 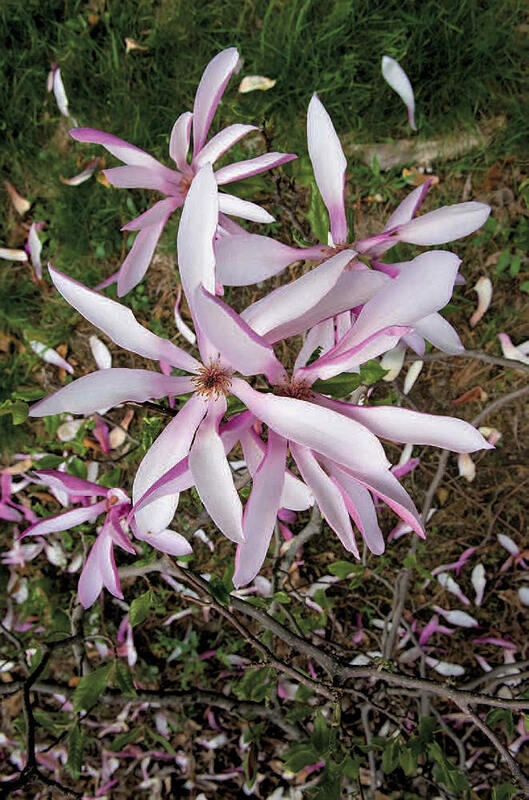 The magnolia blossom with elongated petals, a hybrid named “Judy,” was developed at the National Arboretum in the 1950s as part of the “Little Girl” series. Harrison’s photograph hints at the parentage: the star magnolia (Magnolia stellata), known for white, ribbon-like petals, contributes this characteristic to its offspring while the purple flowers of Magnolia lilliflora ‘Nigra’ explain the tinge of color that rims the petal edges. Beneath the bloom, petals that have gone by lie in soft focus where they have fallen. 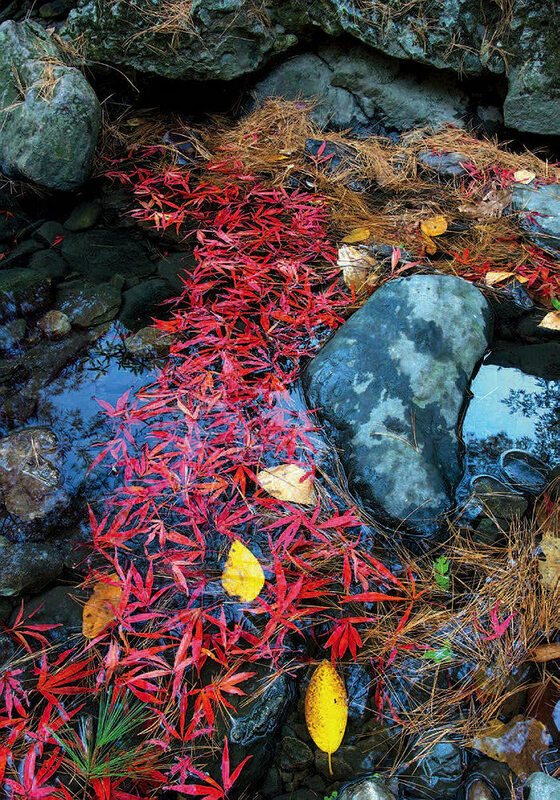 In a photograph of Bussey Brook, which flows east at the foot of Hemlock Hill, brightly colored fall leaves (Japanese maple among them) gather at a spot where the water meets rocks in midstream. One of the great challenges of photographing any flowering tree is that doing justice to the blooms demands moving in close, while showing the trunk and limbs typically requires a wider field of view. 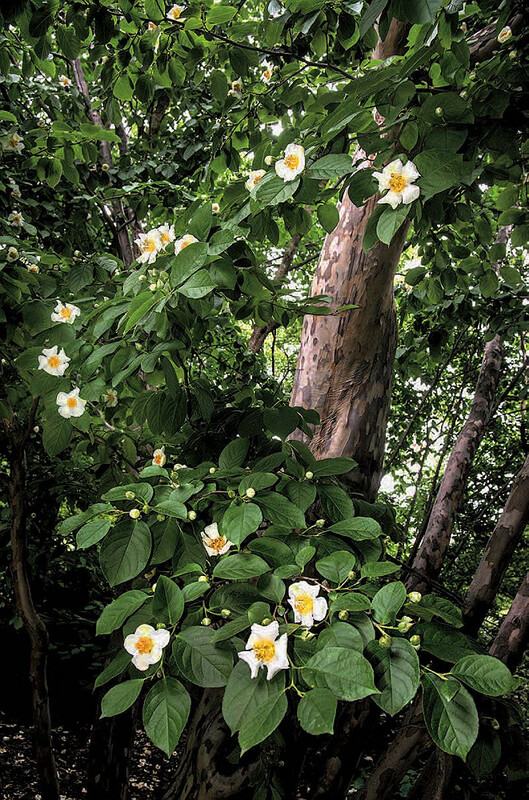 With his photograph of Stewartia pseudocamellia, Harrison flatters this showy, summer-blooming tree, capturing both the waxy, white flowers for which it is named and—through a window in the leaves—the beautifully mottled bark for which it is best known. Seven additional images from the exhibition that can only be seen online appear below. Fall leaves form a path to the foot of a dawn redwood, or metasequoia. An artist’s opening for Continuations will take place at the Arboretum’s Hunnewell Visitor Center on Thursday, August 2, between 5 and 7 p.m.